After more than a dozen years of producing Offshore Racing events, OPA Racing (Offshore Powerboat Association) has joined forces with American Power Boat Association in order to bolster the ranks within APBA’s Offshore Category. 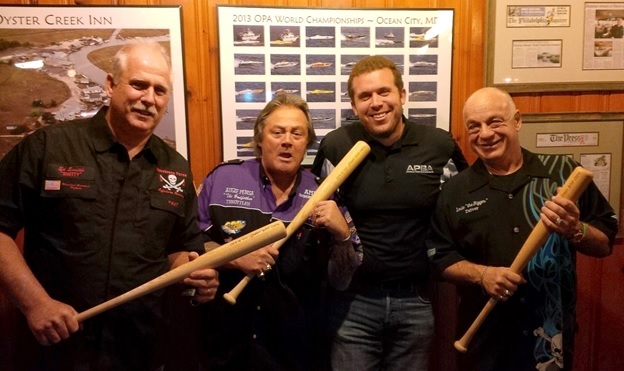 OPA Racing’s “Jersey Boyz” give APBA’s Dan Wiener a warm welcome at OPA Racing’s Winter Awards Party held near Atlantic City, NJ. (Left to right. Ed “Smitty” Smith, Augie “The Godfather” Pensa, Dan Wiener and Louie “Da Rigger” Giancontieri.